Glen Macnow sampling a Cosmi's hoagie in June 2009 at the WIP studio in Bala Cynwyd. He elected not to include it in the 50-plus official reviews of his Great Hoagie Hunt. You've heard of meta-analysis? That's a mash-up of multiple studies in search of a better conclusion. The hope: Create a better "best hoagies" list. WIP's Great Hoagie Hunt may have sampled more than 50 sandwiches, but was that the final word? What about Philadelphia Magazine's "Best of Philly" picks? Or the advice of other educated palates? Here's a roundup of recommendations, including from Inquirer food aficionados Craig LaBan and Rick Nichols. Paesano's, Northern Liberties. Voted No. 1 by celebrity judges at Hoagie Hunt finale - after being picked No. 1 by WIP rater/reviewer/sports- talk host Glen Macnow. "Newcomer does it right," messaged LaBan. Sarcone's, South Philadelphia. South Philly's best, said Philly Mag last year. Highest rating - "5 grease stains" - at Hollister "Holly" Moore's foodie site, www.hollyeats.com. Also No. 3 with WIP judges. Primo's, 50 locations. Won WIP's "Listeners' Choice" award at Hoagie Hunt finale. Voted No. 1 by South Philly Review. Finished high with 'IP judges, too. Chickie's Italian Deli, South Philadelphia. "Maker of some of the best specialty hoagies in town (best veggie, for sure; and a recent tuna special with fresh mozz, artichokes and prosciutto that I LOVED)," emailed LaBan. "Outstanding - 5 grease stains," says Moore of hollyeats.com. "The late, great John Marzano used to swear by Chickie's," WIP's Macnow admitted. Yet Macnow ranked it just No. 18 out of more than 50 he tried. "Two complaints: It's a little stingy on the meat, and a bit heavy on the veggies," he wrote online. Campo's Deli, Old City. "5 grease stains," says hollyeats.com. But Campo's landed a lowly 35th with Macnow, who admits, "Probably, we hit Campo's on a bad day." And out of season, judging from the "tasteless, wooden tomatoes." Lombardi's, South Philadelphia. LaBan gives top marks to the Italian Inferno, "a zesty old Italian topped with sharp provolone-stuffed hot peppers; good meats, well-built in fresh Sarcone's bread." Calling the shop "the real deal," he said, "I just like how Lombardi's builds their sandwiches." Also a favorite of Inquirer columnist Nichols. Macnow liked Lombardi's, too, but ranked it just 11th, because, "well, when we went there ... our hoagie roll was less than fresh." Lou's Sandwich Shop, Norristown. Best hoagie for King of Prussia area, says Philadelphia Magazine: "Sure, technically the Zep isn't a hoagie. But take one bite of salami, prov, tomato, onions, oil and oregano on a Conshohocken Italian Bakery round roll, then try telling us what's missing." How about excellence? suggested Macnow, ranking Lou's a low No. 44: "Too much oil, too doughy a roll, too flimsy with the cheese." Hykel's, Ardmore. "Best of Philly" for Main Line hoagie. "We love the Hykel Submarine Special, which they've been making with bologna, salami, ham and provolone on a long roll, with mayo (or oil), lettuce, tomato and onions, since 1938," says Philly Mag. Glen "Hold the mayo" Macnow ranked it 39th: "Underwhelming. A little thin, a lot too oniony. Lots of salami, hardly any cheese. No offense to Philly Mag, but they need to get out more." 3 places that shudda been contenders? Silvio's Deli, Hatboro. "Best hoagie I ever had" - because of good timing, said Moore of hollyeats.com. "Silvio's bakes their own rolls - I got a hoagie made with bread fresh out of the oven." A Philly.com comment: "Didn't even get a sniff from Macnow" - meaning it wasn't tried - good - more for me to eat!!!" White House Sub Shop, Atlantic City. "The classic sub is sublime when the rolls come hot from the Formica bakery across the street," says LaBan. Got "5 grease stains" for its hoagies from hollyeats.com. Best of Philly hoagie in 2002. Makes Nichols' list as well. In 2008, Macnow even ranked it No. 9 for cheesesteaks. Yet this year, no visit for the Hoagie Hunt. "The best hoagie without doubt or peer," complained reader Steve Goldman, 73, in an email. "I've eaten more hoagies than Glen Macnow has ever even imagined!" Cosmi's, South Philadelphia. LaBan: "One of the most reliable of the S. Philly shops (also makes a good steak). I go basic here, for hot Sicilian or the standard Italian with a mortadella upgrade – a stellar sandwich despite its official nickname (the Rick Nichols)." No wonder Nichols likes it, too. But Macnow declined to review this one, even though he did give it a try as the Hoagie Hunt was wrapping up in June. Mr. V's, Franklin Mills Mall. In a strip mall in the parking lot. "An oasis of homestyle Italian sandwichery (they make pork sandwiches, too) in a wasteland of chains." Also mentioned in recent City Paper story, "The 10 Best Cheesesteaks You've Never Had," by Carolyn Wyman, author of The Great Philly Cheesesteak Book. Voltaco's, Ocean City. For Italian hoagies, "a close second place" at the Shore to the White House in Atlantic City. says LaBan. Carmen's Deli, Bellmawr, Camden County. Best of Philly for S.J. last year. No. 9 overall on Macnow's list, almost making the Hoagie Hunt finale. Abbruzzi and Giuntas Italian Market, Mount Laurel, Burlington County. "First-rate ingredients, dynamite construction and the perfect meat-to-cheese balance," said Macnow, ranking it No. 10. Sarcone's Deli also has a Medford store. Carlino's Market, Ardmore and West Chester. Finished No. 2, close behind Paesano's, with Hoagie Hunt's celeb judges. Our Deli, Paoli. "Best of Philly" 2008 for Chester County: "A classic Italian: Freshly sliced Boar's Head meats are piled high on a sturdy roll." Pallante's, Richboro, Bucks County. Rating it 7th, Macnow wrote, "Guisseppe Pallante's 'Don Supreme' is one outstanding hoagie." Soprano's Deli and Catering, Broomall. No. 12 with Macnow, his top Delaware County choice. 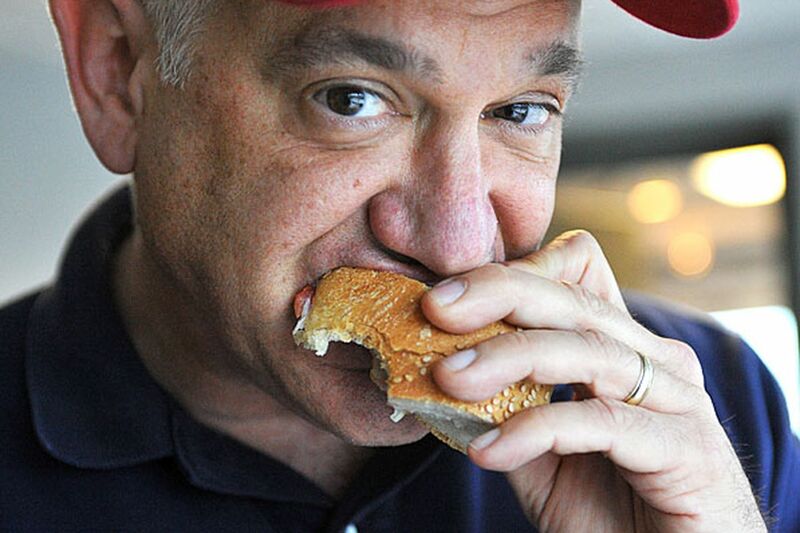 After highly rated Primo Hoagies, Macnow ranked the chains this way: The Fresh Works (his 14th best Italian hoagie), Slack's Hoagies (20), Planet Hoagie (32) and Lee's Hoagie House (40). Planet Hoagie, by the way, was Best of Philly in 2004. Duck Deli BBQ Restaurant, New Britain. Best hoagie in Bucks County, said Philly Mag, is "Duck Deli's delicious smoked tuna salad hoagie dressed with house-made mayo." Dino's, Margate. "A specialty hoagie – whipped tuna with potato chips (crumbled on the bottom) sounds odd, but it's wonderful," says LaBan. For more on hoagies, go to the Philadelphia Hoagies Page. See also the Philadelphia Cheesesteaks Page.